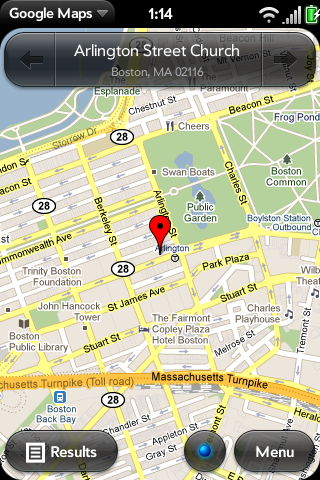 I’ll be giving a demo on May 25, 2011 at the NY Location-Based Apps Meetup about Landmarks: NY. The meetup will focus on a presentation by SimpleGeo (looking forward to hearing from them!) and also a demo about the location capabilities of Windows Phone 7. UPDATE (April 2011): Apple has approved the iPhone version. You can download it here. (March 2011) We’ve been spending the last couple of months developing and testing a version of Landmarks: New York to be submitted to Apple for the iPhone. We’re really close, and we wanted to ask for some last minute feedback. Below are some screen shots — your suggestions and critiques are appreciated! We’ve been using PhoneGap and jQTouch to convert the app from the Palm/webOS platform to the iPhone. It’s been great, even though it’s taken longer than we expected. We think it’s been time well spent, and we hope you do too. Join our mailing list if you’d like to be kept up-to-date! 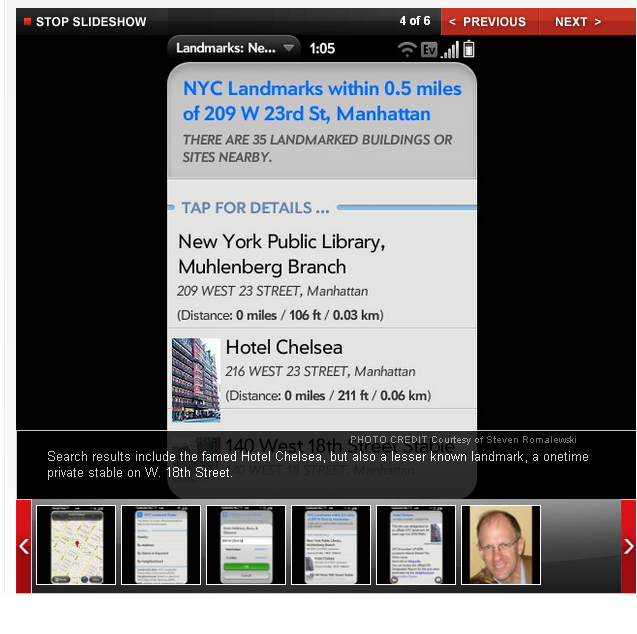 The New York Times City Room has a terrific article about my Landmarks: New York app. Make sure to check out the different versions. If you want to receive updates about the app, please sign up for our email list. Have an idea for another app? Let us know, we’d be glad to see if we can help! Historic Districts Council birthday party! I attended the 40th anniversary party this week for the Historic Districts Council, the citywide historic preservation advocacy group in New York City. 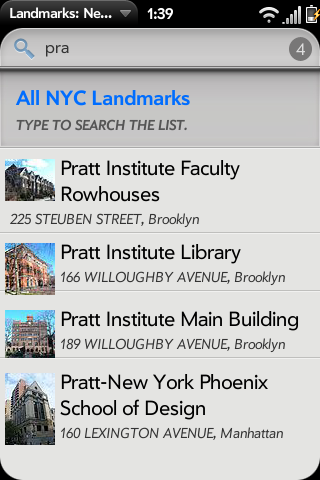 I hoped to meet some key people who might be interested in my Landmarks: New York app. But even if that didn’t pan out, I’ve worked with HDC on and off for a few years and know various people in the group and in related efforts, so at least I’d be able to catch up with some friends and colleagues (and of course help the HDC cause). It was a fun event, and successful from HDC’s perspective and certainly from mine. Among others, I introduced myself to the chair of the NYC Landmarks Preservation Commission and chatted with him for a bit about the app. I also met LPC’s communications director, caught up with longtime Municipal Art Society director Kent Barwick, and enjoyed the ambience of the Bohemian National Hall (OASISnyc map link, and BNH website). Looking forward to another 40 years of HDC’s advocacy success — and working more closely with LPC on my app! The Landmarks: Boston app is now available for tourists, tour guides, architects, historic preservationists, urban planners, realtors, renters & homebuyers, and anyone else curious about Boston’s architectural history. Download it to your Palm here. Landmarks: Boston lists the official landmarked buildings and sites near you, anywhere in the city. For now the app focuses on the 85 locally-designated landmarks in Boston, and will soon be expanded to include sites on the National Historic Register as well as Boston’s renowned historic trails. Some of Boston’s landmarks are well known — Faneuil Hall, Quincy Market, for example. But others are off the beaten path: a teenage home of Malcolm X, the Back Bay Fens (designed by Olmsted), at least 6 theatres, a well preserved townhouse from the Victorian era, and 4 sidewalk clocks. Screenshots of the app are shown below. 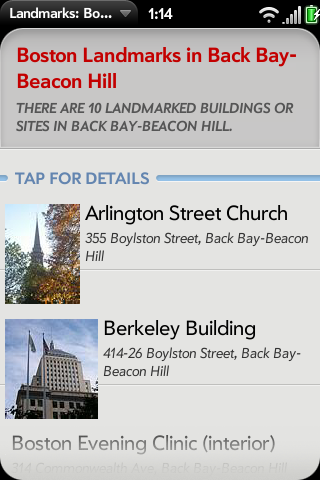 Landmarks: Boston tells you when each landmark was designated (some more than 30 years ago! 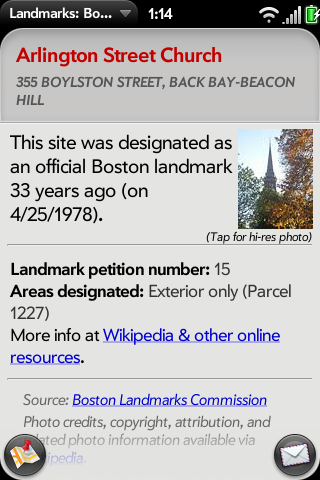 ), provides detailed info such as which portion of the site is landmarked and what parcel it’s located on, and provides links to Wikipedia & the Boston Landmarks Commission website. Thumbnail photos from Wikipedia are displayed for almost half the landmarked sites, plus links to hi-res images. You can view each location on a map, and email details about the landmark with just a single tap. San Francisco is a leader in the open data movement, and in promoting applications that put the city’s data to productive use. 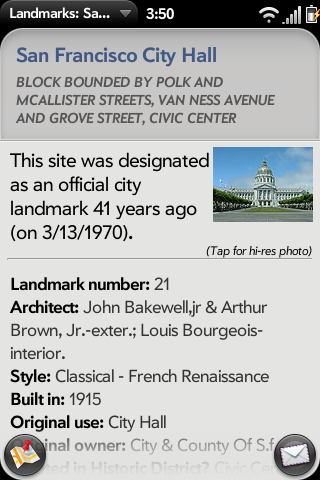 Our Landmarks: San Francisco app was just added to the city’s DataSF App Showcase, highlighting its value for city residents, tourists, businesses, and public officials. When you visit the App Showcase, scroll down in the Etcetera column, where we’re listed along with other leading apps such as EveryBlock, Cabulous, and SF Way. 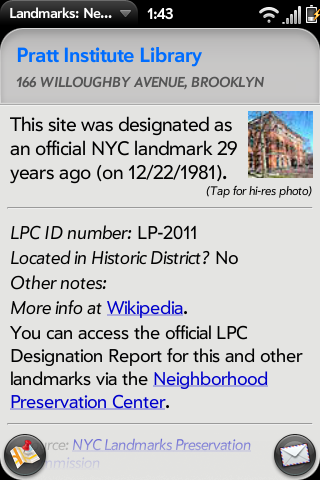 We’ve also cleaned up the display of landmarked info for the app, making it easier to view details about each landmark such as architect, building style, and year built. The screen shot below highlights how ver. 1.1.0 will look. Get it direct from the Palm App Catalog! “Landmarks: New York” was featured yesterday in a great article at DNAinfo.com, an online news service focused on Manhattan news. The article highlights how the app makes it easy to find “undiscovered architectural jewels” throughout the city. It includes a slideshow of screen shots of the app (plus a headshot of me, which I thought was a bit much for the article, but hey, they asked for one) and a good overview of the app’s functionality. Nobody misses Grand Central Station, but many of the city’s 1,300 landmarked schools, cemeteries, churches and synagogues are easily overlooked — and the developer of one new mobile application hopes to change that. Happy holidays, and look for some key updates and new versions (Portland, Boston, and Chicago — here we come) in the new year! The NYC Landmarks Preservation Commission approved 4 new landmarked sites on December 14, 2010 — and we’ve updated Landmarks: New York with info on each one. Alderbrook House (a Hudson River villa in Riverdale, the Bronx). our blog’s original post highlighting the app. 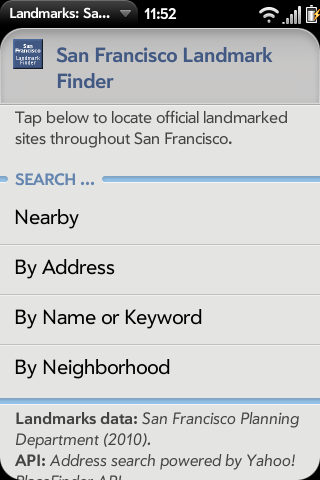 Today we launched our first West Coast version of our landmark finder app — Landmarks: San Francisco! With more than 250 official city landmarks, San Francisco is a leader in the historic preservation movement. 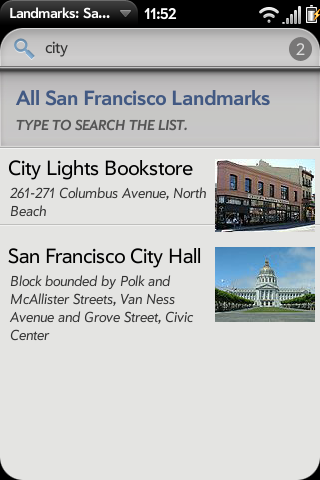 Now residents and visitors in the Golden Gate City can easily locate these sites and learn more about them while they’re out and about with their Palm Pre or Pixi. 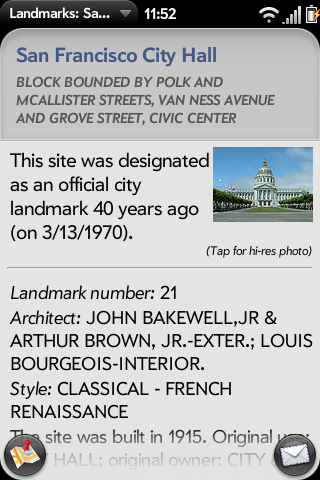 Thanks to the San Francisco Planning Department’s Historic Preservation program and GIS division, the app provides interesting info about each landmark. We not only show a thumbnail photo for many of them, but we also display the site’s architect & architectural style, year built, and the site’s original use and original owner. We also include links to Wikipedia and the NoeHill website. We’ll be adding more photos and updating the info in the future. Feedback is welcome!